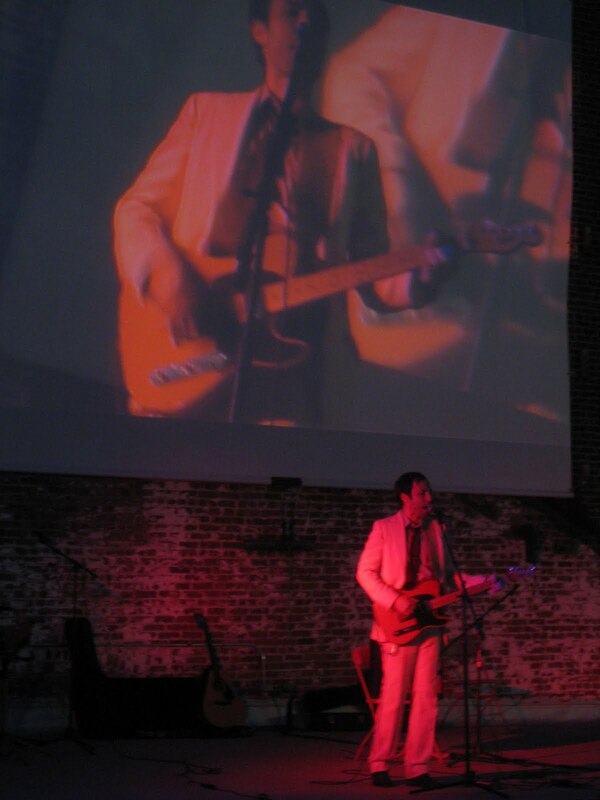 Hartwell Littlejohn performing at Rooftop Films. Image by Micah Clasper-Torch for The NewsGallery. 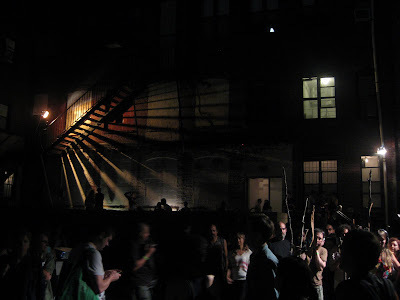 Last Saturday, on the roof of the Old American Can Factory in Brooklyn, (with sponsors IFC and New York Magazine) Rooftop Films continued its strong 2011 season with Creation, Construction, Convento. The night began with music by Hartwell Littlejohn, (a South Carolina native who played an acoustic set) as the full moon rose over the surrounding buildings (pictured left). Dressed in a white suit with tuxedo pants sporting an arrow down the side, his relaxed soulful sound set the tone for the evening. 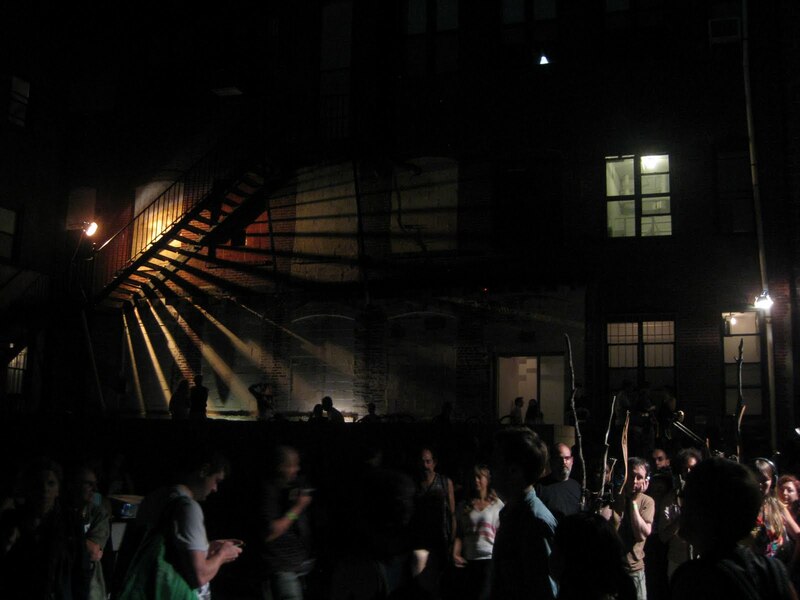 The theme of the evening, Creation, Construction, Convento comprised of “animations, documentaries and art pieces, [which] illuminate a paradoxical paradise where [human], machine, and nature find harmony,” according to Mark Elijah Rosenberg (Rooftop's founder and artistic director). Rooftop Films: Creation, Construction, Convento. The first film presented was Going West, a complex 2 minute stop-motion animation by Martin Andersen (featured above), where we are taken through the pages of a book, amidst intricately cut paper houses, trees and cities. Following, the short films ranged from documentaries, such as, Enid Baxter Blader’s The Ord, which explores an abandoned military base and the 583 murals found within, to fantastical artistic pieces such as Synchronization, by Rimas Sakalauskas, which depicts buildings that break free from their foundations and begin to spin towards the heavens. Rooftop Films: The Old American Can Factory. The art of Christiaan Zwanikken takes center stage in the film, as his kinetic robots—artistic pieces created from metal, machinery, skulls, feathers and wood—move about the grounds. C O N V E N T O / trailer from Jarred Alterman. The Q&amp session after the film allowed audience members to direct questions to director Alterman, as well as Zwanikken. Thereafter, a post-reception was held at the courtyard, where Zwanikken’s work was exhibited, and drinks nicely provided courtesy of REYKA vodka. A nonprofit organization that began nearly 14 years ago, Rooftop Films has gained international recognition, providing a platform for independent filmmakers. With shows running every weekend from May 13th – August 15th, their schedule presents a wide variety of films, including shorts, animations, documentaries, as well as full-length features, within a broad range of indie themes. This week Rooftop bestows a theme of romance featuring the following films: Hope and Heartbreak (Thursday Night), Falling Overnight (Friday Night, trailer featured above), and Orbit (Saturday Night).